Companies benefit from employee brand advocacy programmes through amplified reach, increased customer loyalty and higher lead generation, but what’s in it for the rest of the organisation? Employees from every department gain value from participating in an advocacy programme, though it’s usually the customer-facing teams that benefit the most. That said it leads to benefits everywhere, from HR to sales, training to internal teams too. 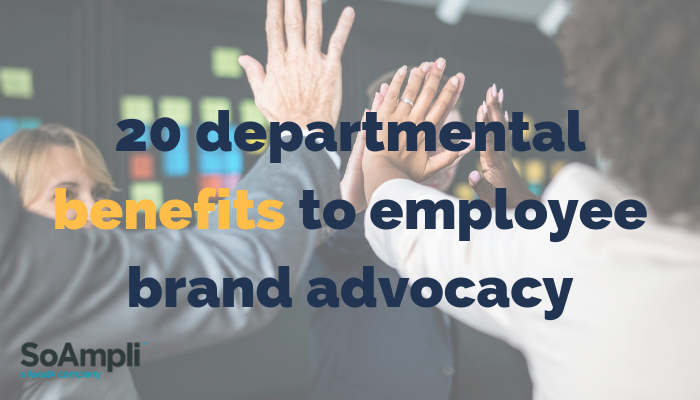 Here are 20 departmental benefits of an employee advocacy programme. Employee advocacy programmes are good for the entire organisation as they promote a positive company culture by giving employees insight into what’s going on with the company. 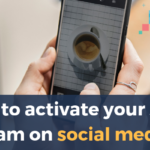 It also repurposes some of the time employees are already spending on their personal social media profiles into a more productive business activity. Employee brand advocacy programmes increase the reach and visibility of a brand. It’s shared by people, not a brand, so it gets around ad blocking technology which has eroded the traditional online reach of brands. People are also more likely to respond to social messages shared by people rather than brands. Therefore, employee brand advocacy programmes change the way marketing does its work. It incorporates more digital processes, channels and tools so that they can create and spread content more efficiently. These programmes also humanises marketing in a way no other media can, by showing the people behind the brand. Research has shown that 20% of employees have shared content about their workplace, compared to only 9% who have shared brand content. Employee brand advocacy programmes increase the amount of content that they customer success team has access to since they’re always on the lookout for valuable, relevant content. They also increase cross-team collaboration; something customer cusses is always advocating for internally. Finally, employee brand advocacy increases the visibility of customer success managers online, adding more weight and status to their personal brand. Helping to boost the authenticity and trust of a brand, an employee brand advocacy programme promotes a digital extension of ‘word of mouth’ marketing. People are considered more credible and believable than brand communication. Such programmes also increase internal alignment with the overall company mission and can act as an ‘internal messenger’ – sharing information between business units, geographic locations and remote employees. Furthermore, an employee brand advocacy programme can increase internal collaboration as well since people are working together to create and find the best content to share. When sales professionals are researching prospects and searching generating leads, an employee brand advocacy programme can help them to know more about their audience. These programmes help sales build revenue-driving relationships when it’s more about connection, education and insight. They can also connect sales to different people within an organisation, which is helpful in account-based selling. Employee brand advocacy programmes move the act of influencing people from a salesperson to people within a network, increasing the chances of finding the right decision-maker and influencing them positively. There’s also the help these programmes offer to sales to personalise an experience for leads and prospects – an important factor for 63% of B2B decision-makers. As discussed, there are so many benefits for an organisation to have an employee brand advocacy programme in place and that can certainly be said for HR and recruiters. Offering a new channel from which to source talent, these programmes also help HR in their research and can subsequently increase employee referrals because the new candidate is most likely to be in someone’s extended network. If they see a job appear on a familiar person’s newsfeed, 45% of jobseekers are more likely to apply for that position. 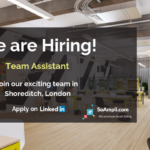 Leading to higher quality hires because of the personal connection they have with existing staff, an employee brand advocacy programme can also help towards more positive emotional connections between the candidate and the company. Employees will feel more connected and enthusiastic about working for the company and they will have a better understanding of the company’s business. It’s also been reported that referred employees are faster to hire, perform better and stay longer in the company. Employee brand advocacy can have positive impacts on an entire organisation, moving it forward towards its overall business goals faster and generating more positive outcomes for customers. It works best with the right combination of people, process and technology; otherwise, it becomes a manual and time-consuming process, with an intangible ROI. Find out more about the benefits of employee brand advocacy via social media in our guide to social selling. Use it to power up your entire organisation!